Oh no… what’s for dinner tonight? I’m all for shortcuts, check out this easy dinner… it’s a take on a duck pancake that I love at Yum Cha and easy to do. Slice the chicken in half so you get 2 thin chicken fillets for each breast (you’ll have 8 altogether). Coat the chicken in cornflour, then dip in egg mixture, then finish in bread crumbs. Heat butter in a large non-stick frying pan over medium heat. Add chicken and cook in batches for 2-3 minutes on each side or until golden brown and cooked through. If I am making a lot of these I put the finished ones on a tray in the oven on low to keep warm while I cook the rest. 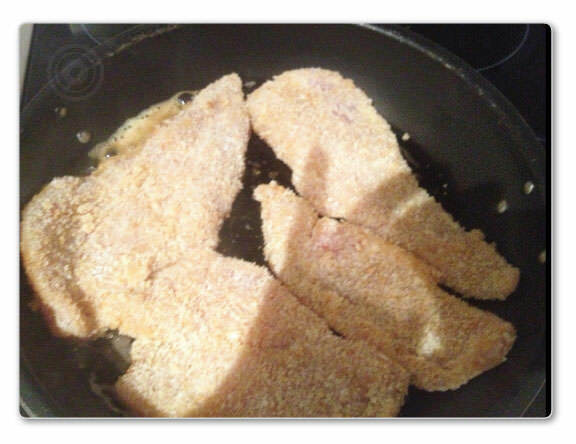 Tip: You could use pre crumbed schnitzel if you are in a rush and just cook to the packet directions (even easier). Cut the mountain bread into 3 long strips per square and heat in the microwave for 40 secs. Spoon half the jar of the hoisin sauce into a cup or small bowl. Then start rolling up your chicken and enjoy. Always a winner at our house. Here’s the hoisin sauce I used, I received no payment for this, just passing on what I think tastes yum after trying many varieties. Same with the corn wraps I use see below. What’s for dinner tonight at your house? I’d love to hear, drop me a line or post your recipes on my facebook page I’m always looking for something easy to make for dinner. Because I get to do it all again tomorrow night. Easy Chicken Pie Jamie Oliver’s Fiery Noodle Salad with Chicken Satay Skewers – my short cut Jamie Oliver’s Chicken Fajitas with Salsa and Guacamole – I love the salsa on toast too! « Happy mothers day – Join the TOMFO more than money photo share!